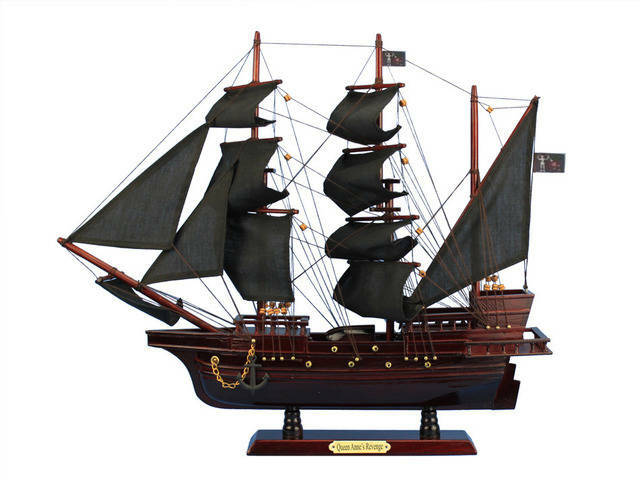 Enjoy the adventurous spirit, the swashbuckling style, and the fascinating history of Blackbeard and the Queen Anne's Revenge home with this fabulous pirate ship model. Place one upon your office desk, or in any room of the house, and add the thrill of the high seas excitement to your life. After taking the bounty and incorporating the crew, Edward Leach, better known as the infamous and legendary Blackbeard, sailed from the Grenadines aboard La Concorde. Born circa 1680, not much is known about Teach’s early life, aside from that he was probably a privateer during Queen Anne’s War. From 1702 to 1713 as France and England battled over control of North America, many privateers joined the cause, especially around Spanish Florida and the Caribbean. As with many of these privateers, it is thought that Teach turned to piracy following the war, using the skills he learned for conquest and plunder in becoming Blackbeard. Moving to New Providence Island, Teach met and fell in with the pirate Captain Benjamin Hornigold, eventually becoming the legendary Blackbeard. After capturing La Concorde near the island of Martinique , Captain Hornigold turned the ship over to Blackbeard as his flagship, to which he added cannons and his menacing flag, and renaming her the Queen Anne’s Revenge. After sinking a French ship off the coast of St. Christopher’s Island, Blackbeard resumed attacks on British, Dutch, and Portuguese merchant and slave ships throughout the area. In March of 1718, off the coast of Belize, Blackbeard and his crew spotted the sloop Adventure, captained by David Harriot, and boarded her. Convincing the captain and several of the crew to join with him, Blackbeard added the ship to his fleet and ventured out for further conquest. Sailing through the Bay of Honduras he collected another large ship and four sloops before capturing a Spanish ship later that year off the coast of Cuba. In May of 1718 Blackbeard and his pirates arrived along the coast of Charleston, South Carolina where the Queen Anne’s Revenge and three sloops came to blockade the port. After a week of raiding ships while awaiting the medical supplies, the medicine was delivered and Blackbeard’s hostages were returned to port unharmed. Following his victory, Blackbeard attempted to venture up North Carolina’s Old Topsail Inlet, now Beaufort Inlet, where he is rumored to have run the Queen Anne’s Revenge aground purposefully. 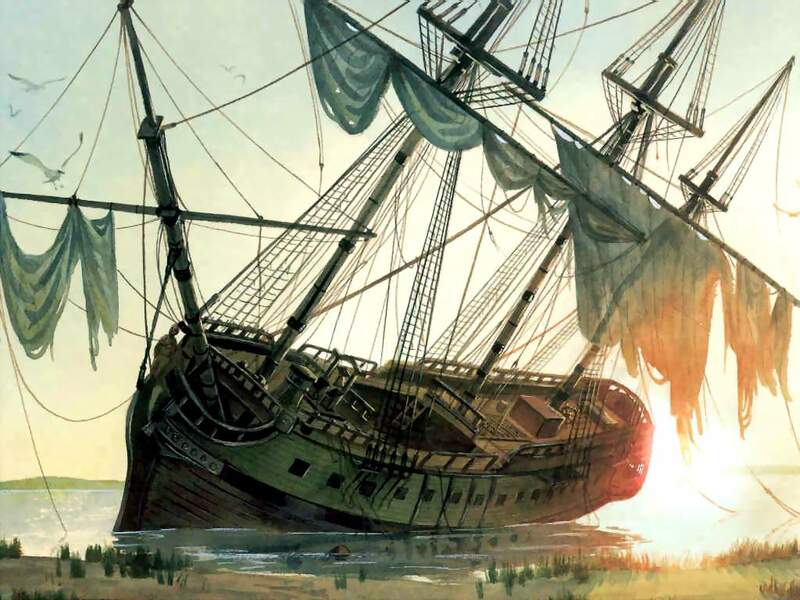 Though the true reason may never be known, what is known is that the Queen Anne’s Revenge ran aground on a sandbar, snapped her main mast and severely damaged her hull timbers, and eventually sank with little fan fair. 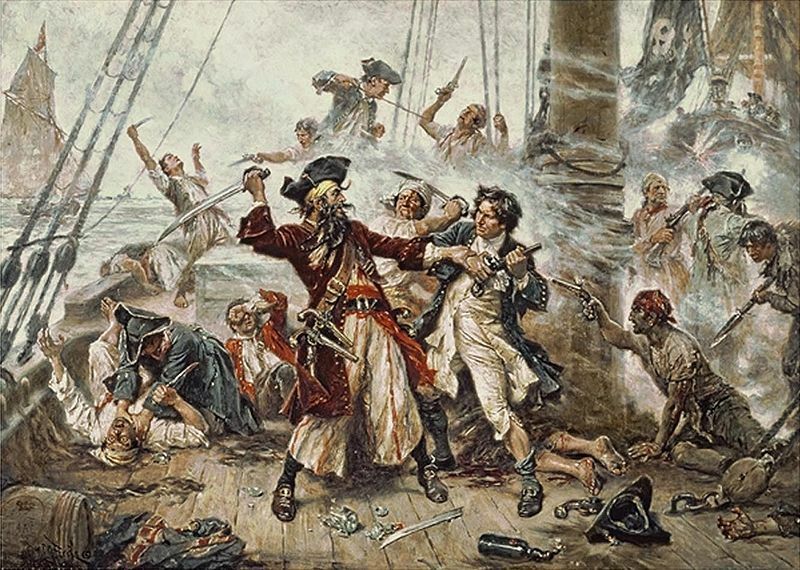 After selecting a crew of his most trusted sailors and gathering the best of the bounty, Blackbeard escaped aboard the Adventure, leaving the Queen Anne’s Revenge to her fate. In 1996 the wreckage of the Queen Anne’s Revenge was discovered off the coast of North Carolina’s Fort Macon State Park. Over 16,000 artifacts have been recovered, including several cannons, and in 2000 and 2001 live underwater video was used for educational purposes. In 2006 more artifacts were discovered at the wreck, and by the end of 2007 almost a third of the ship had been explored. Though there was some controversy as to whether or not the wreckage was in fact the Queen Anne’s Revenge, in 2011 it was confirmed, bringing the history and legacy of both the ship and her captain back to the forefront of popular culture. Used as inspiration throughout the last three centuries for everything from classic pirate stories to modern day cinematic masterpieces, both Blackbeard and the Queen Anne’s Revenge are now legends that will live on forever.